63 percent of the city’s trees are in poor condition, prompting falls. 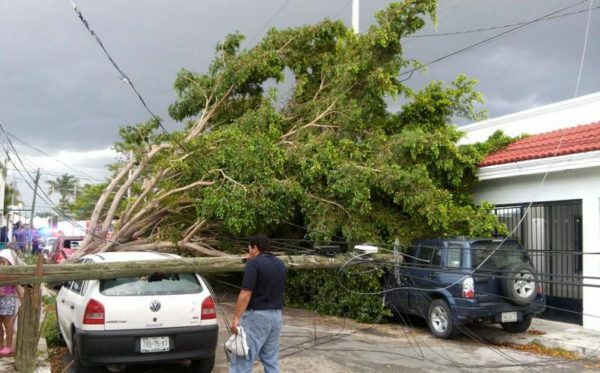 MERIDA — In the city there are two million 317 thousand trees, of which 63 percent are in poor condition due to natural issues, inadequately pruned or planted in places that are not optimal, hence the constant collapse of trees that have been seen in recent months because of the rains. The falls of some trees, mainly of flamboyanes and almond trees, are the result of poor planning when placing them in the main roads of the city, since being in small places their roots do not strengthen and it is impossible for them to support too much weight. The characteristics of the species placed on the principal streets include large branches, when their roots are thin, so that any strong wind of the rainy season causes them to fall down. To avoid this there are patrols of the Department of Civil Protection that pruned them to have a balance in their structure. Due to this problem, the City of Mérida, through the forest crusade, promotes the 55 species allowed to be planted in public spaces, of which only 18 can be placed on the ridges. The regulation recommends planting mainly native species of the state like the balché or the jabín, among others. Merida is the first city in the country to have the correct number of trees per each inhabitant, so that at national level it can’t be compared to any other city. Merida has an average of 2.6 trees per person. However, it seeks to obtain a city with better woodland, which will encourage strategies such as laying green roofs and walls as well as more gardens in homes.